My console can produce a load of colours. But I can't find any obvious way to relate the colour to its number. 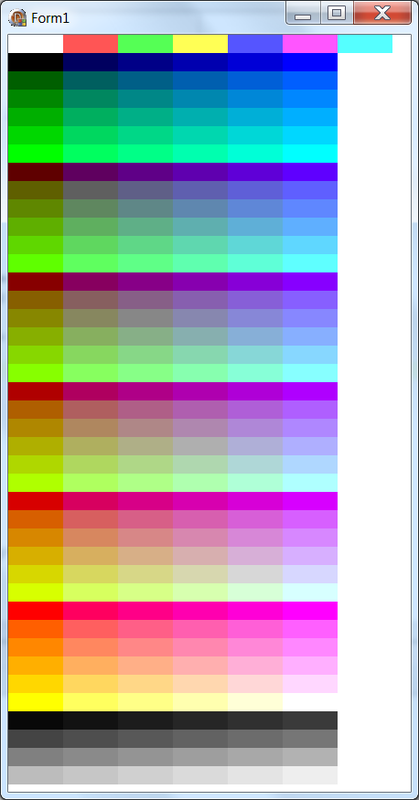 I'd hoped that some bits would map to some of RGB, but if they do, I can't see how. Obviously red-like colours are at 001, 009, 052, 088. Obviously green-like colours are at 002, 010, 022-024, 028-037. It looks almost arbitrary. But there are hints of pattern. There seem to be repeated "fade to lighter colours" for yellow-white, that usually - but not always - contain 6 items (118-123, 148-151, 154-159, 178-181, 190-195, 220-225, 226-231), repeated changes of shading for red-magenta that also usually contain 6 items, this time always 36 apart (016-021, 052-057, 088-093, 124-129, 160-165, 196-201), and a long greyscale sequence (232-255). There's got to be a systematic pattern... hasn't there? Surely someone didn't arbitrarily think "Which 255 colours shall we have" and number them 0-255 as they came to mind? But apart from the repeated-but-not-always 6-ness of it, I'm stumped. What could it be? And again, arranged in 6's. There's clearly a pattern here, but not one I can figure out with any exactness. zsh on FreeBSD 11.2, rendered threough PuTTY with term type = "putty"
I think the history is something like this. Start with 8 colours because 8 is a small power of 2. These are simple: bit 0 for red, bit 1 for green, bit 2 for blue, but 000 means grey rather than black because you're only controlling the foreground and not the background. Then add another 8 colours. Actually, in the image here it looks as if 8-15 may be the same as 0-7; I think maybe they used to mean "flashing" or something? Now extend from 4 bits to 8 bits (i.e., using twice as much storage to describe a given number of characters). This takes you from 16 to 256 colours, leaving another 240 to add. So, write that as 216+24; use the first 216 to go through a 6x6x6 cube of colours, and then the final 24 for a range of greys. For no obvious reason, in traversing the cube B varies fastest, then G, then R, which is the opposite ordering from those first 8 colours (which are a 2x2x2 cube). I made some rather arbitrary choices in the above and the match with the image in the OP isn't perfect, but it's pretty good. [EDITED to add:] Elmy's answer (which presents code basically equivalent to mine above) has what he says -- and I see no reason to disbelieve it -- are the correct values for some parameters in the code above to reproduce the OP's colours exactly. The comments saying // ELMY: in that code give his values. It's 3 iterations of colors. I recreated the exact same colors as given in the question with rather simple code. The first rows of 16 colors are a binary count to 8 (repeated twice with exactly the same colors). The first bit represents red, the second bit green and the third bit blue. I know the binary numbers are backwards, but this way it fits into the RGB schema. That's why the color runs smoothly through 36 similar tones and then suddenly shifts back to red. The innermost loop (blue value) is executed without interuption, when it finishes, the middle loop (green value) executes one single step, before the innermost loop executes again. The red value doesn't change for 36 steps, until the middle loop finishes and the outermost loop (red value) executes one single step. The blue-value-loop finishes at #033. The green-value-loop executes one single step and the blue-value-loop starts again at #034. After that it's an iteration through grey values at an interval of 10. It starts with RGB(8, 8, 8), then RGB(18, 18, 18), then RGB(28, 28, 28) and so forth for 24 colors, which yields RGB(238, 238, 238) as the lightest grey. I know Delphi is not the most widespread programming language ;-) so I'll see if I can reproduce the same program in C#. Not the answer you're looking for? Browse other questions tagged pattern knowledge number-sequence real or ask your own question.